I visited Aleppo, East and West, December 10-14, 2016. I was there when Eastern Aleppo was liberated or fell, depending on your perspective and the media coverage; I was among the first handful of foreigners to get into the East after that event. One can only wonder: There were no Nordic media and no Western media (with the exception of a photographer from Croatia) present on the 11th when this historic event took place. Why? Aleppo is, or was, the largest city in Syria and the third largest in the Ottoman Empire. It’s one of the oldest continuously inhabited cities in the world; it may have been inhabited since the 6th millennium BC – the old city is a UNESCO World Heritage site. All of Aleppo is about 190 square kilometres. I had not visited it earlier but it must have been uniquely beautiful and very dynamic in terms of culture and industry – situated at the old Silk Road too and hosting the largest industrial zone in Syria which gave employment to 30,000-40,000 workers and their families. The destruction I saw in Eastern Aleppo was huge. Indescribable. It was systematic. And it was heartbreaking from every human point of view. Those who occupied Eastern Aleppo – called variously rebels, Jihadists, armed opposition, fighters, terrorists etc. from numerous countries and nations have not only been fighting against the Syrian Arab Army but also fighting each other. Before the destruction was undertaken, the industrial city was looted. Everything of value was taken out of thousands of factories, shops, schools, hospitals and offices – big and small – and transported on trucks to Turkey and sold there – providing these occupiers with funds to buy weapons. The images conveys the clear message that these occupiers who took up arms to fight the Assad government of Syria had no intention of creating a better society and life for those who lived here. It appears to be mostly caused by search for money, by in-fighting, destruction and death for its own sake. Of course the truth is complex and of course neither the Syrian military nor the Russians – operating as the only foreign force that is legally in Syria upon the invitation of the government – are innocent in this destruction. No citizens deserves to have their city, their homes and workplaces, their culture and history destroyed in this manner. No political goal whatsoever could legitimate this barbarity. With this multi-causal destruction of a UNESCO World Heritage site belonging literally to the world, to all of us, the protests against all sides should increase and the blame-game stop. And no government contributes to such destruction without a reason. It’s time Western media, grosso modo, get courageous enough to report how the West (NATO countries and its allies) is highly co-responsible for this destruction through its political, financial and military support to those who occupied Eastern Aleppo during 4 years. I’ve seen the destruction of places like Sarajevo, Vukovar, Krajina, East and West Slavonia, Abkhazia and South Ossetia. This was worse. It reminded me partly of the images from the Second World War, partly of Hiroshima. This is why I allow myself to consider it a liberation and there is another photo story here that illustrates the happiness among the people I met. This doesn’t mean that there were not also people elsewhere who were not happy, and Western mainstream media have been good at telling you about them. I just did not meet them and cannot report or show pictures of what I have not experienced. Hotel Al-Shabah in the West was where I stayed – as did all visitors at the time – and I was able to both experience the day and night bombings from its 20th floor as well as the shelling of the West, as close as a few hundred meters from my hotel when the stadium nearby was hit from the East one afternoon. The fact that the Western parts were targeted from the East and people there felt in danger during the four years of the occupation – and thus relieved and happy that it was over – has been under-reported in the West and many media therefore unable to understand that there were celebration on that side too when Eastern Aleppo was liberated. Much more about Aleppo and what it looked like before 2012 here. For your information, I was free everywhere to select the scenes and people I spoke to and photographed. I was not embedded with the military at any point but did travel with military protection in a couple of cases before and after the liberation when bombs still fell and the risk of sniper targeting was considerable. These were places where you would not be allowed by the Syrian authorities to enter without such protection. Below find a few maps found online. I visited the Hanano district, the old town and the Shaikh Najar industrial city in the east. The map to the right gives some rough impression of which forces controlled various parts of Aleppo. The visit to Aleppo at this historic moment was part of a ten-day conflict and peace fact-finding mission by the Transnational Foundation for Peace and Future Research, TFF, in Lund, Sweden of which I am the director. Our gratitude to those who support the foundation in its work for the UN norm of making peace with peaceful means and made this mission, the first since the violence broke out in Syria in 2011, possible. To the extent that we can raise the funds, it will be the first of more missions. Thanks for helping us continue this mission here. It begins with the 20th floor view from the West towards the East and the night skye with an explosion at the horizon and then depicts various aspects of the – utterly senseless – destruction. For the sake of destruction itself. This series, in contrast to the other series, depict the physical destruction rather than the human beings and their fate here. However, I hope the photos will make you think about the people who lived behind the walls – some still living there – and had their homes there, went about their social life and earned their living in these streets. 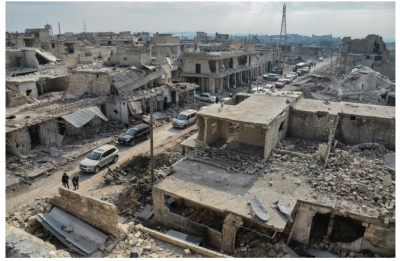 It’s very difficult to know – and sources vary markedly depending on affiliation – how many people (civilians and military) have been killed, wounded and displaced in Aleppo. Statistics depend on time span, who is counted, sources of information, validity of sources and level of confirmation; affiliation of counting agency, definition of death (death from being killed by a weapon, natural death during period measured, suicide, immediate death versus delayed death after being wounded, indirect death such as caused by war-time stress by ut not being killed). Some count civilians, some count regular and irregular fighter, and some people killed or wounded were both – e.g. civilians at daytime and fighters in the night. And even if there were reliable figures – which I have not been able to find on the Internet – various sources would tend to blow up figures or reduce them depending on their political interests (i.e. misuse of figures for propaganda purposes. The only thing that can be safely stated is, simply, that way too many innocent people have suffered, been wounded or died. In Aleppo as well as in all of Syria. One interesting thing about them is the type of destruction you see. If, as the media tell you, Aleppo had been destroyed mainly from the air by the Russian and Syrian planes, the cityscape would have been much more flat. What you see is that this has been street-to-street, house-to-house and even floor-to-floor fighting and the damage caused by smaller weapons fired from the ground close-up or nearby. I was told by soldiers that they did not fancy aerial bombardements because they would hit them too. Bombs from the air have been targeted at military command centrals, underground military facilities and ammunition depots; it is only maximum 7-10 per cent of the destruction of Eastern Aleppo that has been destroyed by the airforces. Finally, many of the images here are snapshot-like. They are shot either with my Nikon D7000 or my iPhone 6S. They are taken under very difficult circumstances, no time permitting the search for the perfect angle or focus; some are “drive-by” photos shot out of the car window. But they have all been processed and improved upon my return from Syria. All rights reserved to these images. Under no circumstances must any of them be reprinted or reposted online without my written consent. From a school used by the occupiers and where no classes had taken place over the last two years. The clean-up of debris had begun here and there. Life must go on. A monument on which the terrorists have written their greeting to the world. Symbol of a crucified city?